We’ve all heard stories from our grandparents and older relatives about the “Old Days.” I sure do. I can recall sitting in the living room listening to my grandparents, great aunts, and great uncles talk about the way things used to be. How our families came to live where they do today, who’s related to whom, and great deeds done in bygone days. I sat with rapt attention, hanging on their every word— doing my best to imagine the setting of those stories— in the process, doing the best to paint pictures in my mind. Today, my grandparents are gone. So are most of the patriarchs of my family. I can only remember portions of those tales, but the pictures remain— merely blurred by the passing of time. Wouldn’t it be great if there was something to link the events in my relative’s lives to my family in the present? A bit of the past that could connect my heritage with my life today? Wouldn’t it be even better if those links to the past were freely available on the internet for other people and communities around the world to access? The River Street Digital History Project was conceived as a way for the residents of a historical community to make their memories and stories available to people around the world and to future generations. By turning historical photos, documents, and audio recordings into digital files that could be uploaded to the internet, some of the former residents of the River Street Neighborhood in Boise, Idaho have made a portion of their lives available to the rest of the world. They’ve donated their memories and given the world an easily accessible way to enjoy them. During the summer of 2014, a wealth of archival documents were digitized in preparation for their dissemination via this website. This website owes a debt of gratitude to the employees of the Idaho State Historic Archives in Boise, the Idaho State Historic Preservation Office, Special Collections at the Boise Public Library, and staff of the Albertsons Library at Boise State University who all helped make this project possible. Some families have curated old photos and newspaper articles. These tidbits of the information help keep present generations grounded to their family’s past. A few of these families have decided to donate these tangible resources to the various archives in communities around the country. Boise, Idaho is no different than hundreds of other communities in the United States. Boise is host to one of the branches of the Idaho State Historical Society’s Archives. At the archives in Boise, families from across the state have donated fragments of their past in order to be stored and maintained in perpetuity for future generations. 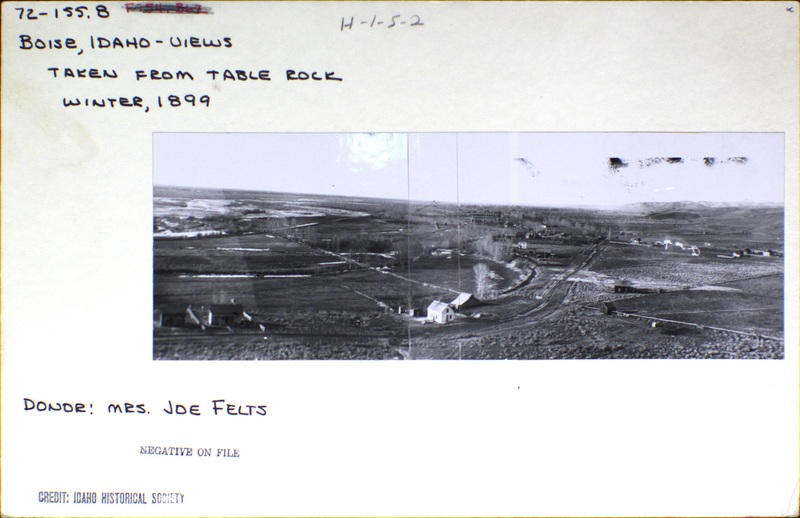 In addition to receiving donations, the Idaho State Archives actively seeks out historical documents, photos, and other files to add to their collection. The archives is just one of the many ways people can access fragments of the past. One of the best ways to commemorate the past is by talking with the individuals about their histories; by having direct conversations with the elders among us. It is particularly beneficial to record these conversations using a tape recorder or digital recorder. Historians and anthropologists who record these conversations call them oral histories or ethnographies. Oral history projects are important because they document past events as they were remembered by the individuals that lived them. Sometimes these memories differ from the newspaper accounts curated in archives, but they are equally important because they provide a different perspective. There is no right or wrong interpretation of the past. There are simply different perspectives. Oral histories provide those different perspectives. Archival repositories do an excellent job of curating the tangible fragments of our past. They are sorely needed in our fast-paced, disposable world. But, the files housed in archives have some limits. The largest limitation is the fact that you actually have to go there to see their collections. For many people, the extra effort required to visit prevents them from doing so. We are all busy and, sometimes, the archive is not open when we have the time to visit. Digitizing archival collections is really the only way we can make them accessible to all. Sadly, the archives’ staff are limited. Budgets for archival repositories are always precarious. Volunteers are frequently used to fill in staffing shortfalls and the paid staff spend most of their time inventorying collections and helping visiting researchers. Basically, there is not enough manpower to digitize the whole of our archival collections. The River Street Digital History Project attempted to convert all the existing archival data on the River Street Neighborhood into an easily accessible digital format that anyone with internet access can use. This work in one small corner of a mid-sized American town has brought a wealth of information within reach of people around the world. This wealth of data represents a small fraction of the total quantity of archival data that exists about Boise, Idaho and an even more miniscule portion of what we’ve collected about the history of the State of Idaho. It is almost too easy to say we need more projects like this one, but that is the truth. The wealth of archival data that exists in this country will remain in a marked box filed away in a building somewhere unless average Americans take the initiative to digitize the existing information about the places that count in their lives.